One of the fun things about having your contacts on iPad is that you can associate photos to them. Photos help you recall exactly who a contact is, whether business, family, or friend, and besides, they are just plain fun. 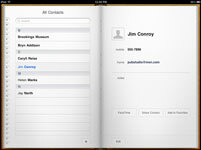 The photos you assign to contacts come from the photos stored on iPad. 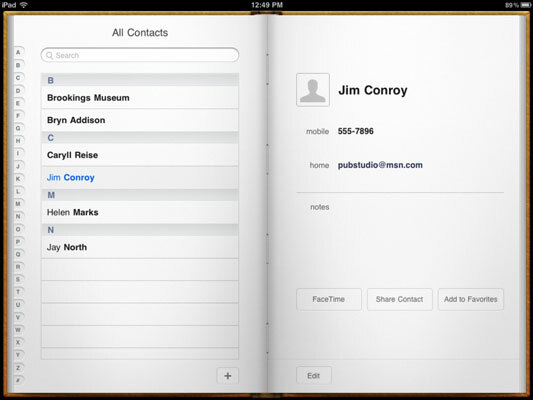 If you don’t have a photo of a contact, you can use the iPad cameras to take one. 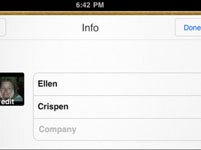 1With Contacts open, tap on the contact to whose record you want to add a photo. The contact’s info appears on the right. 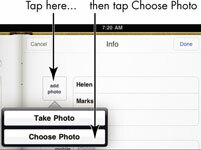 4Tap Choose Photo to choose an existing photo in the Photos app Camera Roll. The Photo Albums dialog appears. If you tap Take Photo, then the iPad’s camera is activated. Take a photo of your contact to add it to the contact’s information. 5Tap either Camera Roll or Photo Library, or any photo albums you might have created yourself, depending on where the photo is stored. Saved photos are ones you’ve downloaded to your iPad or taken using the screen capture feature or the iPad 2’s cameras; the Photo Library contains photos synced from your computer. Once you make a choice, the photos in that album appear. 6Tap on a photo to select it. 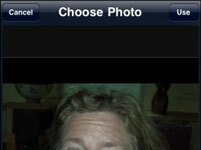 The Choose Photo dialog appears. You can modify the photo before assigning it to the contact. Unpinch to expand the photo and move it around the space to focus on a particular section and then tap the Use button to use the modified version. 7Tap the Use button to use the photo for this contact. 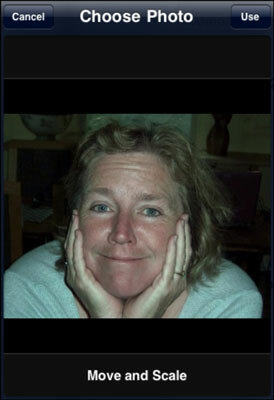 The photo appears on the contact’s Info page. Changes to the contact are saved.